The Jolly Hotel Carlton is a 4 star deluxe hotel ideally located in the centre of Amsterdam. The hotel offers 218 luxury bedrooms, 9 comfortable meeting rooms accommodating up to 150 delegates, an Italian speciality restaurant named ?Caruso?, a Grand CafÃ© ?Il Girasole? and a private garage. Staying at the Jolly Carlton means enjoying the pleasures of refined comfort, in the best of italian traditions. Genuine guest comfort is a promise the hotel keeps in each one of its 218 rooms. The suites also have direct-dial telephone with PC interface, in-room safe and hydromassage bath. In the cosy atmosphere of the Italian speciality restaurant Caruso, you will experience the best of Italy. The original ornaments and decorations remind you of the days that Josephine Baker, Mistinguette and Louis Armstrong performed here. Thanks to its nine reception rooms, the Jolly Carlton is also one of the most elegant settings for conferences, receptions and meetings, in the heart of Amsterdam. The multi-functional rooms are not only suitable for private meetings and presentations for smaller groups but also as a sub-room during larger meetings. The multi-functional rooms are equipped with all modern facilities, for instance ISDN lines, fax connections and direct telephone. The Jolly Carlton is a Tourist hotel. 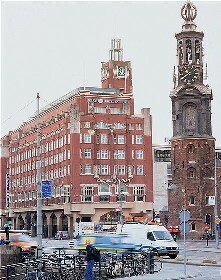 Located in City Centre - Rembrandtplein area. Shopping is accessible by bus/taxi and the nightlife/restaurants are easily accessible by taxi or bus from the hotel. Descriptionclass="small" style="text-align: justify; font-size:11px;">The Jolly Hotel Carlton is a 4 star deluxe hotel ideally located in the centre of Amsterdam. The hotel offers 218 luxury bedrooms, 9 comfortable meeting rooms accommodating up to 150 delegates, an Italian speciality restaurant named ?Caruso?, a Grand CafÃ© ?Il Girasole? and a private garage. Staying at the Jolly Carlton means enjoying the pleasures of refined comfort, in the best of italian traditions. Genuine guest comfort is a promise the hotel keeps in each one of its 218 rooms. The suites also have direct-dial telephone with PC interface, in-room safe and hydromassage bath. In the cosy atmosphere of the Italian speciality restaurant Caruso, you will experience the best of Italy. The original ornaments and decorations remind you of the days that Josephine Baker, Mistinguette and Louis Armstrong performed here.